As avalanche forecaster for the Wyoming Department of Transportation, Jamie Yount’s job is to predict when and where avalanches will happen … and then trigger them. 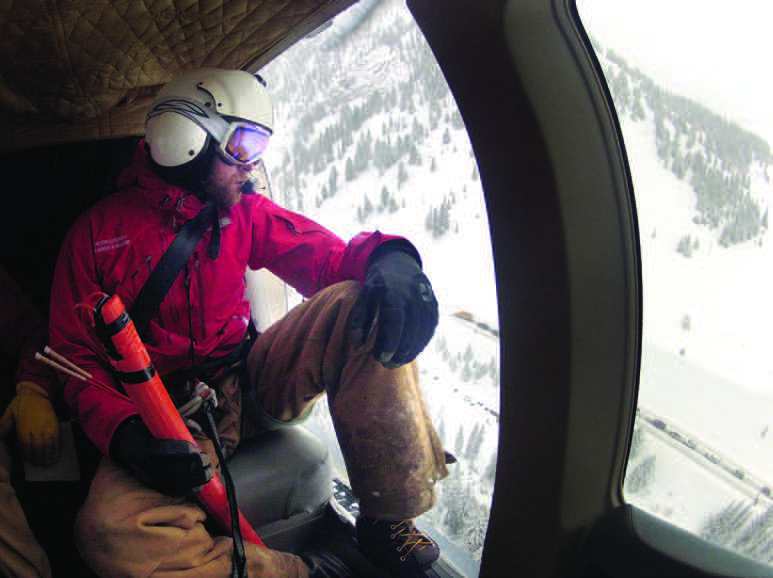 For his job as Wyoming Department of Transportation avalanche forecaster, Jamie Yount tosses explosive charges from a helicopter to trigger avalanches before they naturally release and potentially injure motorists on roads below. A hard life indeed. Until you compare it with Yount’s own winter stresses. “My worst nightmare is having a natural or skier-triggered avalanche on Teton Pass come to the road and having it get a car,” he says. Across the country, avalanche forecasting is a fairly niche field. “It’s a pretty small community of people who do what I do,” says Yount, thirty-six. “I know the entire community in the U.S.” Most state Departments of Transportation do not require the services of an avalanche forecaster. And not all states that do avalanche control use military artillery. “There are eighteen programs in the country that use artillery for avy control,” Yount says. WYDOT is one of them and all use the same weapon, a M101A1 105mm Howitzer. Each of the eighteen is a member of Avalanche Artillery Users Of North America, of which Yount currently is chair. Seven of the eighteen are Departments of Transportation; the other eleven are ski areas. Yount doesn’t say this outright, but his job truly is a matter of life and death. 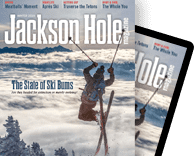 Daily, an estimated five thousand cars travel Teton Pass (Hwy 22), one of the three major avalanche areas that fall under the purview of WYDOT District 3’s Jackson office. The other two zones are the Snake River Canyon (U.S. 26/89) and the Hoback River Canyon (U.S. 191/189). Teton Pass gets the most attention from the public, but together, these two canyons have enough avalanche paths that photocopies of photographs of them fill a three-ring binder, which sits—its pages crinkled from age and study—in Yount’s office. The three main avalanche zones are the reason that, last January and February, with winter storm after winter storm stacked up—dumping rain and snow on the valley floor and fifteen feet at the top of Teton Pass—Yount, along with most everyone else on WYDOT’s snow removal staff, worked forty days in a row. “I don’t really have a schedule. It’s a weather-dependent job. If it’s storming, we’re superbusy; if it’s not, we get caught up,” Yount says. The GAZEX system above Teton Pass uses air blasts to trigger avalanches in two of the most slide-prone areas, Twin Slides and Glory Bowl. 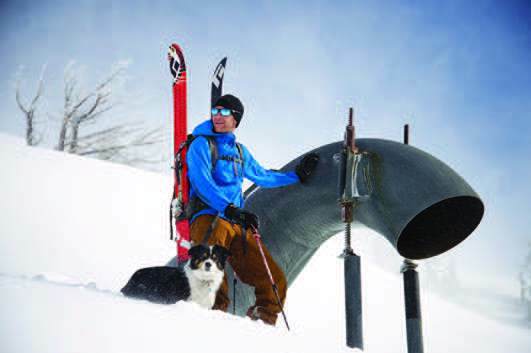 A newer model was installed and used in Hoback Canyon last winter. SITTING DOWN WITH Yount in his sparse, dusty office off the hallway leading out to the equipment/maintenance area in Jackson’s WYDOT administrative building last March, a week or so after his forty-day stretch ended, he was at the tail end of a brutal cold. “I got sick right after the storms ended,” he says. “My body was worn out and beat down and finally gave up.” Over those forty days Yount and twenty-some other WYDOT employees from mechanics to maintenance men, foremen, avalanche control specialists, and engineers worked “lots of early morning hours and lots of late nights,” Yount says. Skiing Glory Bowl is one of Yount’s favorite parts of being an avalanche forecaster. 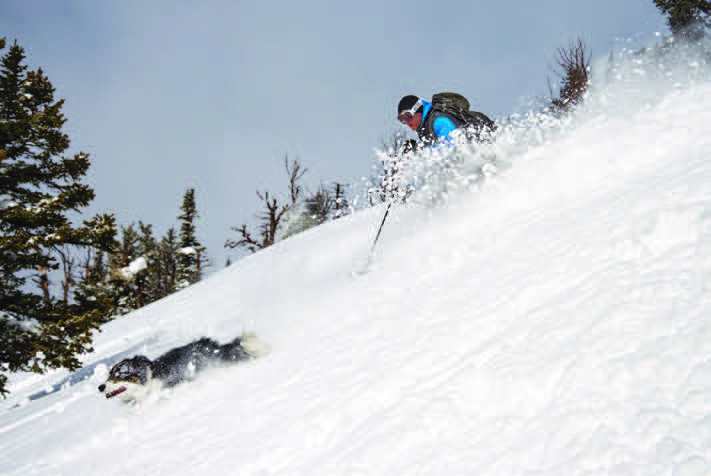 THE HOBACK AND Snake River canyons don’t have the skier issues Teton Pass does, but they have difficulties of their own. The terrain in the Hoback Canyon is so rough and gnarly Yount can’t get a firsthand look at the snowpack. “It’s not like Glory. I’ve never been up the paths in the Hoback in the wintertime, and I will never go,” Yount says. “Instead, I go to little test slopes and try to guess from those what’s going on thousands of feet higher up.” Then, the canyon is so narrow and the slide paths above so steep, “almost any sort of small avalanche will make it to the road,” Yount says. Finally, there are no road closure gates in the Hoback Canyon, so there needs to be additional staff to stop cars. AS YOUNT WAS growing up in Bozeman, Montana, his father was director of Bridger Bowl Ski Area’s ski patrol. “Through exposure to that, I got to know guys at the avy center in Bozeman,” Yount says. “From a young age, I thought theirs was the coolest job ever. It was a long-term goal of mine to become one myself.” Yount graduated from the University of Utah with a degree in meteorology in 2002. “Being able to forecast is a big part of what I do,” he says.